Attorney Robert Fennessy is experienced in several areas of law, including family and divorce law, landlord tenant law, employment law, and municipal and animal law. Attorney Robert H. Fennessy, Jr., Esq. 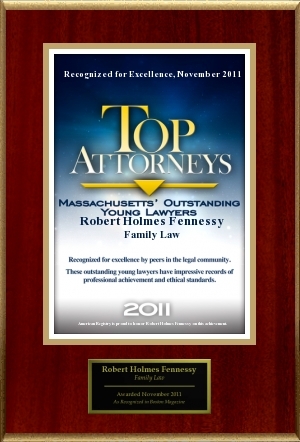 Attorney Fennessy is admitted to the Massachusetts Bar, the U.S. District Court for the District of Massachusetts, and the United States Supreme Court. He routinely practices before the Family and Probate Courts in all matters involving divorce, separation, and family law. Attorney Fennessy is an Adjunct Professor of Law at UMass Law School in Dartmouth, and was formerly an Adjunct Professor of Law at the Southern New England School of Law. He has been an elected official in his town for more than two decades as Selectman, Finance Committee member, Conservation Commission, and Constable. 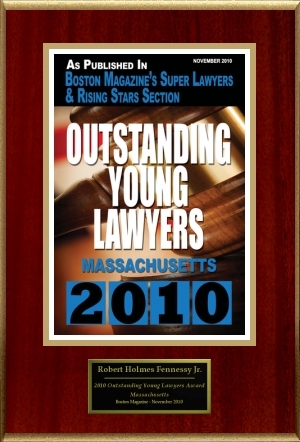 In 2007, Attorney Fennessy was recognized as the "Up and Coming Lawyer of the Year" by Massachusetts Lawyers Weekly, and in 2010 he was named and recognized as an "Outstanding Young Lawyer" and "Rising Star" in the legal profession by the trade publication "Super Lawyers." Juris Doctorate, Southern New England School of Law; Ed.M Boston University; B.S. Northeastern University.